The overall concept was to create a unique, medium to high income residential complex that acts like a white canvas. Since each home is different from one another, it was crucial that this particular 8 houses residential complex would allow its inhabitants to customise their homes as they pleased. The entire complex is created using a neutral color palette. 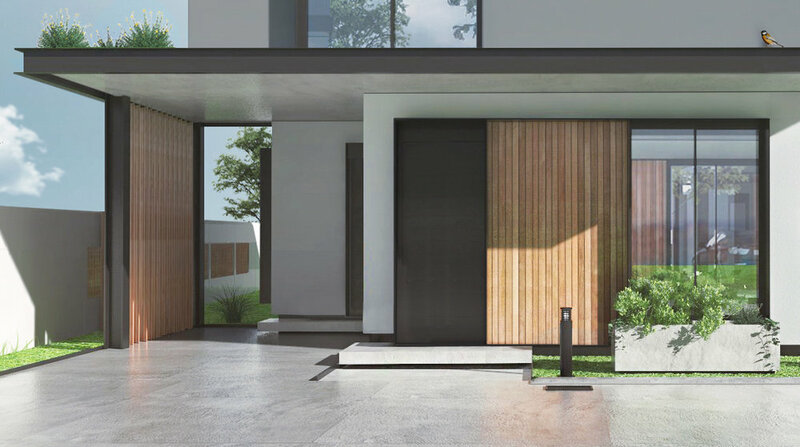 Shades of grey, emphasise each of the houses, while the warm, light oak wood creates a visual reference for the main entrance. Because of the site's proximity to the Mogosoaia lake, each house is strategically oriented so that the surrounding natural landscape can be seen from inside the residences. Martha Bibescu residential complex is designed using a central service road that acts both as a pedestrian walkway and a car access. The site is surrounded by a series of forests and rich natural landscapes. On the service road one can find trees and other natural element that creates a harmony between the residential complex and the surrounding natural environment. With a rising demand for residential housing, this project is a testimony that building on the ground, with respect to the natural environment can be an alternative, sustainable solution to the current way we design this program.